MIDI Guitar 2 for iOS was just released on App Store. It is is now almost a 1:1 port of the desktop/VST/AU version. Tracking is very fast and more responsive and sensitive than most (hardware-) solutions which means it picks up articulations very well. However, its slightly slower than the desktop/plugin version of MIDI Guitar 2 due to a fixed buffer size of 6 milliseconds and eventually iOS’s audio processing may be slightly slower than a carefully configured audio desktop/laptop. The App also inherit most features of the desktop/plugin version. Most notably it has pitch bends, better velocity handling and a full stack of guitar effects and an amp sim with more Amp Cabinet responses than any other amp-sim app we know of. There is even a polyphonic tuner and an interactive chord wheel to assist with chord progressions, both free of charge. IMPORTANT: MIDI Guitar 2 is very CPU hungry – especially if you add amp and effects. Luckily Apples newer chips are also blazing fast. Using MIDI Guitar’s built-in synths and guitar amp and effects together you need a new iOS Device (iPad Air or iPhone 6), but if you only use the MIDI output to play external synth external apps (including Garageband), you can get away with an iPad 4 or IPhone 5. MIDI Guitar’s internal modules are more CPU-hungry because it will process everything on one CPU core. Contrary, if you play an external synth you can utilise both CPU cores and sustain higher loads. We will try to improve CPU efficiency further in the future. 1. AudioBus, and Apples new iOS AudioUnits (v3) is the next thing we will look into. Please mind that, MIDI Guitar doesn’t have any compatibility issues with AudioBus that we are aware of, and happily run alongside your AudioBus setup, if you have the horsepower. 2. MIDI Inputs (from controllers or other external sources) is missing, compared to the desktop version. Please mind that usually you want to hook a MIDI controller up to the synth, not to MIDI Guitar, and thus MIDI inputs usually aren’t really needed. 3. Further CPU optimisations to ease the load on older iDevices. 4. Some nice Reverbs will be added, hopefully a system much like the Amp Cabinet Mining. New customers will have to get the same in-app purchase to unlock the MIDI outputs and the price remain $20. 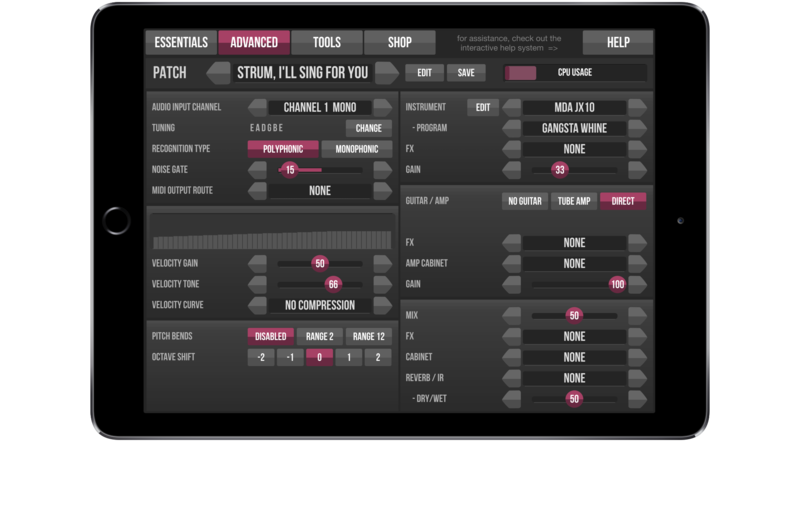 For both new and old customers there is a new In-App purchase which unlocks all the features of Advanced mode (including the built in synths, pitch bends, etc..), priced at $10. Everything is of course free to evaluate, Many features (including a polyphonic tuner and interactive chord wheel) are all free to use as much as you want. Get it now at iTunes / App Store. It’s free to try. … and please leave us a nice rating while you are there – it’s the best way to support developments and help us out. Please first read the built-in help system. Is should serve as an introduction and also a reference for most settings. Then write to our support, using the form on this website. Please don’t use the app review system for support issues (we have no way to get back to you this way). For an general introduction please see the MIDI Guitar 2 product page. Lots of user videos here. Stay updated ? – sign up for news.